The British rocker is father to Bing with actress fiancee Kate Hudson, and told the Metro he is already showing signs of following in his footsteps. 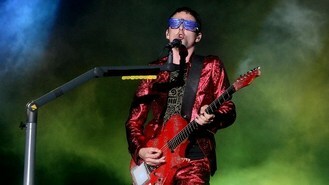 Matt said: "My son Bing, he loves music. Whenever we play Starlight, he's seen me on stage doing the clapping thing. So every time we play it he puts his hands above his head and starts clapping." Family man Matt, whose fiancee Kate has a seven-year-old son Ryder from her first marriage, performed at the Brit awards this week, but revealed he popped home during rehearsals to hang out with his kids. Matt revealed: "I got the Tube here because I wanted to pop home and see the kids for a little bit. "Sometimes when you do these events there is a lot of waiting around. I had a break for three hours and I said 'I'm just going to pop home'. To save a car journey I thought 'f*** it' I will get on the Tube and have lunch, hang out with the kids. We went for a walk in the park and then got back."